West Indian people are very particular about their food. International students are always concerned about whether they’ll manage to get their usual cuisine in a different country. Luckily, there are some relatively solid options in Surrey. This is the main supermarket for students, as it is conveniently located. 10 minutes walking from Stag Hill (main) campus and 5 minutes walking from Manor Park. At Tesco, there’s an aisle for World Foods, where you can find some familiar Caribbean products- including seasonings, malt drinks, sweet bun, water crackers, beer (Guinness, Red Stripe, Carib..) and quite a few essential food items. The section isn’t huge, but it’s definitely helpful when you’re making some good West Indian curry. This spot Guildford town centre is part of a chain of Caribbean restaurants all over England. I personally haven’t eaten from them (sorry, trust issues), but their menu includes dishes like trini doubles, jerk chicken, patties, curry, roti, chow, plantains and a whole lot more. I have heard mixed reviews, but I suppose it’s definitely worth a try! You never know how close they’ll come to the authentic tastes. 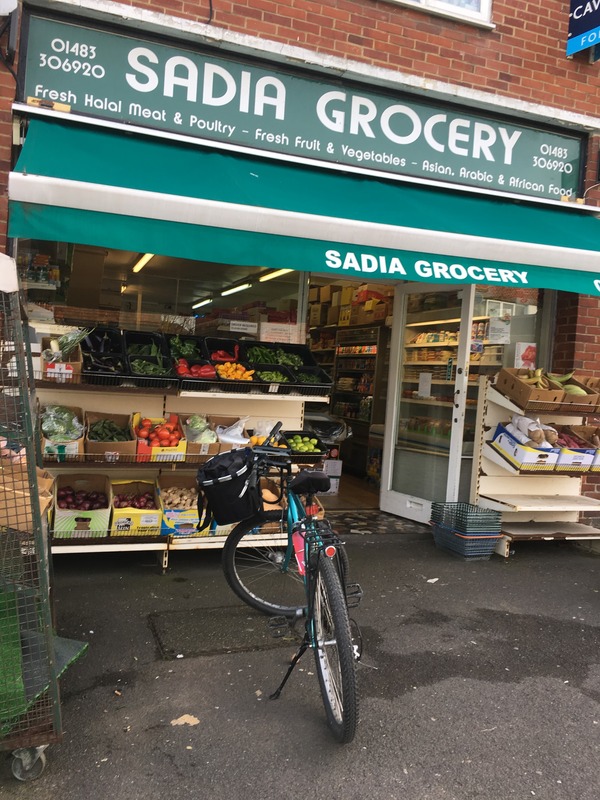 Tucked away on Woodbridge Hill is this lovely little grocery that sells fresh produce, including ground provisions like dasheen, yam, cassava and PLANTAIN as well as a range of East and West Indian products that you’ll find nowhere else in Guildford. Certainly the only place you’ll find saltfish in this town. If you live on campus, it takes a little bit of exploring to find this family-owned business, but it’s definitely worth the trek! Every Thursday there’s a fresh market that comes right onto campus, bringing produce to you. Along with plantains served by the pound, there’s a vendor by the name of Foy Cuisine who sells Afro-Caribbean food (namely, jerk chicken or rice and peas). If you want to have it any other day of the week, you’ll have to travel to Woking (1 stop away from Guildford on the train) where they set up everyday, just opposite another stall that sells a range of Afro hair products. You’re not absolutely guaranteed to get tropical produce here, but if you’re lucky, they’ll have papaya, mangoes, plantains, ochro (okra) and other fresh ingredients that taste like home. 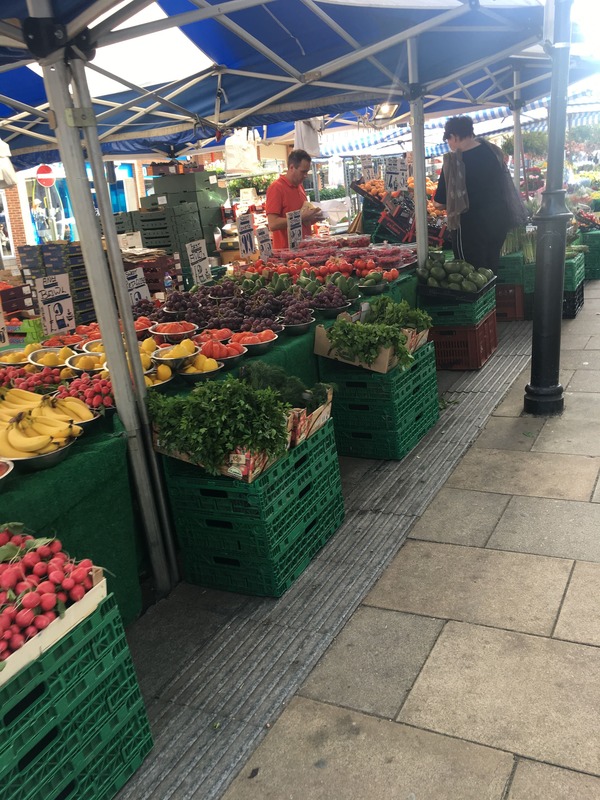 The vendors come out on Friday and Saturday every week, but it is worth mentioning that you can get amazing bargains on fruit and veg anyway! Definitely worth a visit. If none of these options can suffice for your home-food craving, just remember that London is only 40 minutes away, and the possibilities there are endless! England in Spring: Brixton Market…Jerk Roti?